Ohio River tug boat powered with two 3600HP EMD engines running at the same RPM. The starboard engine is equipped with the Fitch Fuel Catalyst, the port engine is not. The emissions reduction is visually obvious. It is estimated that each year the nation's 12 million powerboats exhaust into the environment 400-450 million gallons of unburned fuel (compared to 10 million gallons spilled by the Valdez). Treatment with the Fitch® Fuel Catalyst greatly improves combustion efficiency and would dramatically reduce unburned fuel from this source. In addition there is a resultant increase in horsepower, improved fuel economy and extended engine life. Units are available to equip everything from the smallest outboard motor to larger diesel engines, and will pay for itself in fuel savings alone after only a few months (varies with fuel cost/consumption and usage). Fitch has appeared in publications such as Southern Boating, Go Boating, Yachting and Power & Motoryacht. Advanced Power Systems International's Fitch Fuel catalyst was rated "Best"in an independant evaluation of in-line fuel treatment devices by "Yachting Magazine". 1. Fuel Consuption was reduced by a minimum of 7% which the "Yachting" staff described as " impressive". Based on calculations provided by "Yachting" of fuel savings of one gallon per hour at $1.00 per gallon total fuel savings would be $7,500.00 over the 5,000 hour life of the product or a net savings of $6,750.00 after the recovery cost and installation charges. 2. Exhaust Emissions were reduced 30% to 40%. Reductions were seen in Nitrogen Oxide (NOx) Nitric Oxide (NO) and Sulfur Dioxide (SO2). It was noted that since nitric oxide and sulfur dioxide decreased in parallel that it was a "sure sign of cleaner combustion." 3. Both fuel savings and emission reduction were monitored. The Fitch Fuel Catalyst performed well on both emissions and fuel efficiency, performing better than all of the other products tested. Click here for Fitch sizing examples for marine use. June 2012 - FAS Seafoods in Victoria Canada is a large company who is now a believer in the Fitch Fuel Catalyst and moving ahead to save money on their fuel costs. Not only have they been happy with the initial results but now they are now outfitting 7 more boats along with gensets in their fleet. Owner Bob Fraumeni is now outfitting the fleet after experiencing the "lowest all time fuel bill" on his Ocean Pearl, equipped with a Cat 3512 engine. This shows the strength and value of savings available for many operators out there, especially in these times of high fuel prices. Commercial Fishing Vessels Save Fuel and reduce emissions! 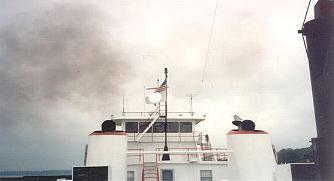 Passenger boats use the Fitch. Also the Barrus Report on testing the FFC on a Yanmar 4HLA Engine! Western Fish Company is so pleased with the results of our investment in the Fitch Fuel Catalyst on our two fishing vessels that we are now in the process of outfitting our fleet of refrigerated diesel trucks so that we can reduce that fuel expense as well. We were approached by Mr Paul Riley, the distributor for Townsville and North Queensland in regard to the Fitch Fuel Catalyst in October 2003. Marshelly fishing Co operates four prawn trawlers out of Innisfail in Far North Queensland. We decided with some reservations to try the Fitch Fuel Catalyst out on one of our vessels. This vessel is fitted with a V12 Mercedes and has 360 hp rating with a fuel consumption of 700 litres per day. We found after 42 days at sea, our fuel consumption had been reduced to 630 litres per day, therefore providing a saving of 70 litres per day or 490 litres per week. It has been noticed that exhaust emission have become almost visually non-existent. We are impressed enough to now fit our other three vessels including two trucks and assorted generators. We have also hosted Paul and John from Fitch Fuel Qld at our home to talk to other trawler operators in Innisfall. This achieved a positive response. In April of this year my wife and I purchased the 33' Motor Vessel 'Minerva' being an older timber hull vessel driven by a 50hp Diesel Perkins 4108 4 cylinder engine. I noted that the engine smoked considerably and as a motor mechanic considered the valve guides and seals may need servicing or replacing. Whilst I was totally skeptical with your proposal that I drop the Fitch Fuel Catalysts into the fuel tank to alleviate the problem I never the less accepted to do this on the basis that there was a 90 day cash back warranty. I cannot believe the difference which has occurred. After leaving them in the tank for one week, our next outing saw a small puff of smoke on starting the engine and then absolutely nothing from there on.No longer do I have to clean the transom. Whilst motoring there is no longer the smell of diesel rolling over the stem into the rear cockpit. It is frankly amazing. Over the past two months since dropping in the 'bullets' the engine is a lot quieter and is running more like a brand new engine. In all my years as a motor mechanic I have seen many devices that have been marketed but in pretty much all cases they did not deliver. The Fitch Fuel Catalyst does exactly what you said it would do and I am so impressed that I intend to purchase one for my Nissan vehicle. There is no doubt you are on a winner here and be assured I will be more than happy to advise my clients and friends of the benefits of this product. Last year i installed your drop-in Fitch Fuel Catalsyt in my 35 HP Johnson outboard motor fuel system which resulted in major operating improvements. Quicker starting, smoother running, more power and noticable lower emissions. I believe that anyone who operates a marine powered 2 cycle engine will share my enthusiasm for your "break through" product! Three years ago I installed our Fitch Fuel Catalyst in two Catapillar 3208TA 375 HP in a boat. We noticed reduced smoking and a fuel savings of 10%. A day of fishing meant 60 to 63 gallons, today it means 55 to 65 gallons per day. I purchased a Fitch Fuel Catalyst system for my sports fishing boat Blue Fin IV. The vessel has a GM 6V92 Turbo Charged, After cooled, blower-bypass diesel engine that, under normal conditions has a fuel flow of 88 gallons per hour, including return... after a few days I noticed significant decrease in smoke and then calculated 10% improvement in fuel consumption. I have also noticed the engines run much smoother and start a lot easier. I am pleased that the Fitch Fuel System is doing everything you told me it would and can recommend it to everyone. I want to thank you for the opportuniny to use the Fitch Fuel Catalyst....I use a small 24 foot open fishing boat, "seminar"...My boat was fast and fuel efficient and I really did not think it could be improved upon until I tried the Fitch Fuel Catalyst. I ran trips...the last two weeks and noticed an increase in economy...the boat burned 24 gallons of gas,(12 gallons per day across the bay and back). Prior to the installation of the fuel catalyst, I was burning 26 to 30 gallons depending on sea conditions, the number of people and gear...In conclusion I really do think this fuel catalyst helps, even though I don't understand exactly how it works. The F750 installed on the V8 Detroit propulsion engine on the "Southern Comfort II" has now settled in with the following very pleasing results"
1. Fuel consumption is down by 18.2%. We are now using 27 liters/hour as distinct from 33 liters/hour, a saving of 36 liters of diesel in a trawling night of 6 hours. 2. There is a definite increase in horsepower! 3. Exhaust emission is virtually non-existant. 4. In short, the catalyst's performance is outstanding and beyond our expectations. Here are some interesting results on the Fitch Fuel Catalyst on the two Detroit 671-TI 485 HP engines on my 41' Hatteras Sports Fish. Prior to their installation I was averaging 34 gallons per hour for the two engines. This was based on an average of 150 hours. After installation I ran another average over the next 115 hours of 30 gallons per hour which is an improvement of 11%. This, of course, considered idle in restricted waters, and cruising, where I normally run 2200 RPM. In addition...I found less soot deposit on the stern of the boat. I'm satisfied with this product, and would recommend it to anyone interested in saving fuel and keeping the enviroment greener. ... We installed the Fitch Fuel Catalyst on the 3406 Caterpillar main engine in the fishing boat I am captain of. We currently fish albacore in the north and south pacific. The Fitch was installed with 3 way valves so we could choose to use it or bypass it and track any consumption differences with the "Flow Scan" fuel meter on the main. What we found was at 1250rpm we used approximately ¾ of a gallon an hour LESS fuel and approximately 1.5 gallon an hour LESS at 1450rpm. That equates to about 1500 gallons LESS fuel used on a 90-day trip. As you can see it effectively extends the time we can spend at sea. We should use around 4500 gallons less fuel in the coming year and that means a dollars savings of about $3100.00 @ .70 per gallon. Considering the cost of the Fitch that's the best deal I've had in along time! R. Thiel editor Power and Motor Yachting , Jan 2001 "
... on our 43 ft Fairline with twin Volvo Penta 73Ps'the Fitch Fuel Catalyst reduced soot on our transom. This is a solution to transom soot worth considering. It sure cleaned up our act. ....I would like to provide some information to you regarding the use of the Fitch Catalyst for my 37' Pacific Trawler with Cummins 6BT5.9M engine during 1999. During 1998, we recorded 228.7 engine hours with 683.8 galllons consumed for a figure of 2.99 gallons per operating hour. During 1999, since last winter's installation of the Fitch, we recorded 256.1 engine hours with 646.6 gallons consumed for a figure of 2.52 gallons per operating hour. This unscientific study produced a fuel consumption savings of 15.7% since the previous period. In addition, there was a marked decrease in exhaust soot at the transom, we probably didn't wash the transom more than 3 times the whole summer. Another thing we noticed was that pyrometer readings were consistently 10-15 degrees below identical engine rpm settings of the previous year, although there may be some variance due to different load conditions. We did not consciously operate the engine any differently in 1999 compared with 1998, and with the number of operating hours, a significant variance probably does not exist that could be attributible to load, weather and other variable conditions. The Fitch Catalyst in our application also treats diesel oil sent to our Espar furnace, Northern Lights generator and Dickinson cabin heater, and we have also noticed a decrease in sooting from all these units. In the case of the furnace, this was the first cruising year where maintenance to clean the unit was deferred until next year. We are very happy with the Fitch Catalyst. ....on a 270-hp. Mercruiser yielded a 2-horsepower increase in performance, 5% cooler exhaust, and a 10% savings in fuel consumption. "No other bolt on option, including intake valves, manifolds or carburetors gave me the increase Fitch did. After some of the previous changes I had to imagine the difference. With Fitch, the proof was in the TACH!" "We have seen a reduction in fuel consumption of 8% when compared to the usage prior to installation as well as to that during the same period last year." "At first I was skeptical about the product, but after a few days I noticed a significant decrease in the smoke and then a calculated 10% improvement in fuel consumption." "We noticed reduced smoking and a fuel savings of 10% ." We feel it is fair to say our fuel consumption has improved by approximately 10% -12%." "….an improvement of 11%. I’m satisfied with this product and would recommend it to anyone interested in saving fuel and keeping the environment greener." "Fuel consumption is down by 18.2%…there is a definite increase in horse power….exhaust emissions is virtually non existent." "In short, the catalyst’s performance is outstanding and beyond our expectations." "I believe that anyone who operates a marine powered 2 cycle motor will share my enthusiasm for your "break through" product." After three years of testing on it’s boats, the Packard Boat Company has begun distributing a product that Packard President Bud Finkl calls amazing! "There is no question as to the catalyst’s ability to meet these claims. But in spite of the facts, it is hard to believe unless you have tried it for yourself. We read of these wild claims almost every week, but here is a product that delivers, probably for the first time in the history of internal combustion engines. Bud says that he has seen proof that emissions of carbon monoxide can be reduced by as much as 65% to 90% , and unburned hydrocarbons are reduced by the same amount. Nitrous oxides have a reduction of about 30%. But there is an additional bonus. According to Finkl, his lovely Packard runabouts show a 5% to 10% reduction in fuel consumption. Diesel engines have a similar bonus. The apparent fuel octane rating is increased about two points, plus an 80% to 90% reduction in exaust smoke. Copyright © 2013 PMC Ltd.